Aspire Logistics’ Event Management department is organizing Ramadan Sports Festival 2016 (RSF) starting Friday June 10, marking the fifth day of the holy month of Ramadan, until Friday June 24 (19th of Ramadan). Competitions will take place between 9:30 pm and 11:30 pm. The festival features 13 competitions, 90 teams, and more than 1000 participants between men, women, and children under 18 years of age. This year’s festival engages men in 5 competitions with the new addition of cricket this year, as well as 4 others: football, basketball, beach soccer, and volleyball. Women will also participate in the festival with 2 competitions: tennis and volleyball although Qatar Women Sport Committee is not taking part in this year’s festival. Additionally, and in collaboration with The Qatar Paralympic Committee, this year will prioritize people with special needs with a table tennis competition for the following 4 categories of disabilities: mental, physical, visual and hearing-impaired. Step into Health program is also organizing a walking event during Ramadan inside Aspire Dome, from 3:00 pm till 5:30 pm daily (except for Fridays), and from 8:30 pm till 11:30 pm all week long. 12 participating teams, each team consists of 13 players in addition to the coach and administrator. The stage group system will be adopted for the competition throughout 8 days starting Friday June 10, 2016 until Friday June 17, 2016. Games will take place on the Warm Up Track. 12 participating teams, each team consists of 8 players including the coach and administrator. The stage group system will be adopted for the competition throughout 5 days starting Thursday June 16, 2016 until Tuesday June 21, 2016. Games will take place in Aspire Dome, Multipurpose Hall 1. 8 participating teams, each team consists of 9 players including the coach and administrator. The stage group system will be adopted for the competition throughout 5 days starting Friday June 10, 2016 until Wednesday June 15, 2016. 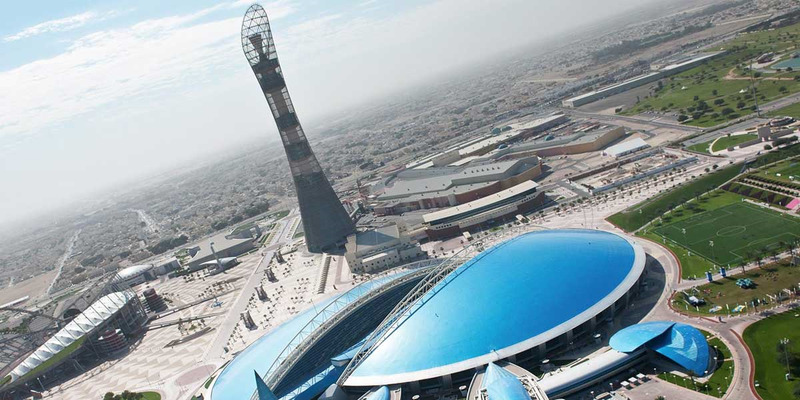 Games will take place in Aspire Dome, Multipurpose Hall 1. 12 participating teams, each team consists of 8 players in addition to the coach and administrator. The stage group system will be adopted for the competition throughout 5 days starting Monday June 20, 2016 until Friday June 24, 2016. Games will take place in Aspire Dome, Multipurpose Hall 2. 12 participating teams, each team consists of 8 players. The stage group system will be adopted for the competition throughout 4 days starting Friday June 10, 2016 until Monday June 13, 2016. Games will take place in Aspire Dome, Multipurpose Hall 2. 8 participating teams, each team consists of 8 players in addition to the coach and administrator. The stage group system will be adopted for the competition throughout 5 days starting Tuesday June 14, 2016 until Saturday June 18, 2016. Games will take place on the sand pitch. 6 participating teams, each team consists of 7 players. The stage group system will be adopted for the competition throughout 2 days starting Tuesday June 21, 2016 until Wednesday June 22, 2016. Games will take place on the Warm Up Track. 10 participating teams, each team consists of 8 players. Competition will take place throughout 5 days starting Monday June 20, 2016 until Friday June 24, 2016 from 9:30 till 11:30 pm at the Aspire Dome, volleyball court.